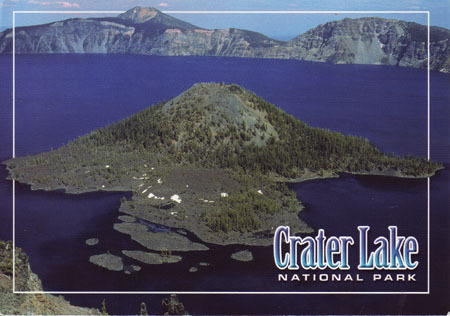 We just received this postcard from Brian D. in Oregon. It’s amazing that it arrived to us because it was damaged in the shipping. If you can see, our P.O. Box number was accidentally ripped off of the card. 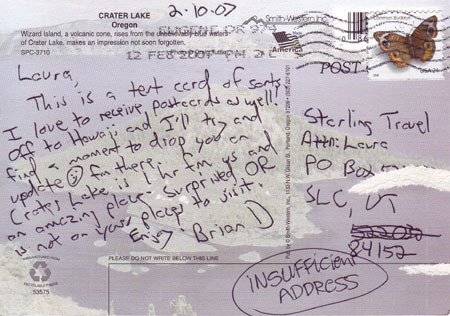 Fortunately, Brian had inadvertently written our box number as the zip code and then crossed it out. I don’t think it could have gotten to us otherwise. Brian says he’s surprised that Oregon isn’t listed in one of my places to visit, and quite frankly, I’m surprised as well. Mike and I spent a lovely week in Oregon last year at the foot of Mount Hood. I’m shocked I didn’t write about it. Never fear, Brian! I’m going to drag out the photographs I took and write a few entries about our lovely stay in Oregon! Please send me a postcard from your travels or your hometown. If you do and it’s interesting, I will publish your postcard on Starling Travel. It’s like sending a postcard to the whole world when you go on vacation. It’s like bragging about your hometown to the everyone on the planet. Okay, no matter how I write this it’s going to sound WRONG. Mermaids is a gaudy and bright casino that hands out metallic beads to the tourists passing by. It is loud and crowded, but compared to the horrible monstrocity of The Fremont Street Experience, it is a quiet and beloved haven. We had taken in our fill of the Neon Sign Museum and had enjoyed it thoroughly, but the rest of Freemont Street was an unenjoyable mess. Instead of the exciting walks down the Las Vegas Strip, all the “excitement” coming from Fremont Street was artificial. The people there were assaulted with noise and lights. They weren’t happily talking about their win at the slot machine. It was impossible to have a conversation without yelling. When we walked into Mermaids, the ambient casino noise seemed like silence compared to the cacophony outside. We waited in a long line, trying to figure out if this was THE line for the deep fried Oreos, deep fried Twinkies, foot-long hot dogs and mile long margaritas. Once we realized we were in the correct line, it was a fifteen minute wait just to order. 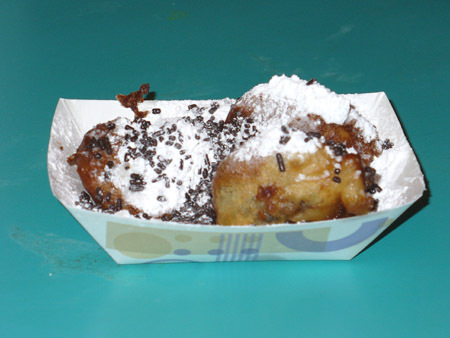 Our deep fried Oreos, came quickly after ordering, though. If you have ever dipped an Oreo into warm milk, then you’ve got a good idea of how deep fried Oreos taste. The frying process warms up the cookie and that partially hydrogenated oil in the white stuff warmed up to a tasty frosting consistency. It was good, but I only needed one bite before I was finished. Luckily, we shared. 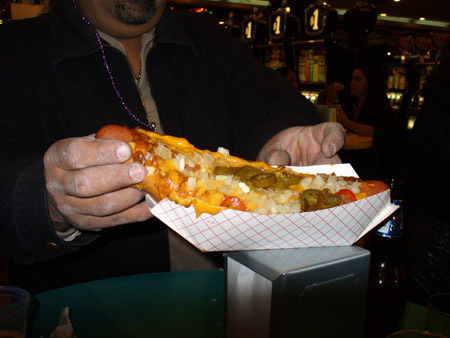 We didn’t order the hot dog, but this gentleman was kind enough to let me take a picture of his. 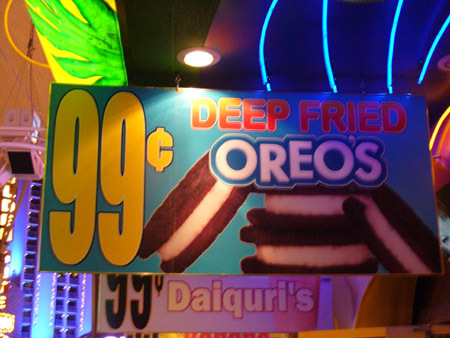 Frankly, I think I would have liked the hot dog with all those jalapeno peppers better than the greasy Oreos. We have never been back to Fremont Street since. The only thing enticing us was the deep fried Oreos, but even their delicious and greasy goodness isn’t enough to entice us back to the noisy mess of The Fremont Street Experience. Tango Diva – Tango Diva Travel Blog » Blog Archive » Video blogs! All the snow is Salt Lake City is getting me down, so it was nice to see this beautiful vista and imagine that it was me riding that horse! If you have gone camping for more than three days in a row, you can understand the appeal of portable showering devices. The problem with most of them is that the water is COLD. 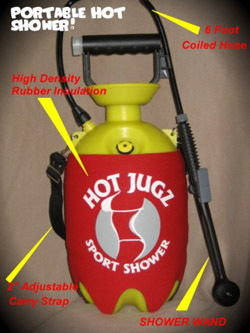 With Hot Jugz, you can heat up the water before putting it into the device. It’s being advertised as a great alternative to beach showers. It is supposed to keep the water warm for seven hours, so you can fill it up at home, swim, surf or snorkel to your heart’s content and then wash the salt off your body with warm water instead of the cold stuff. They’ve based the name of their product on the fact that it keeps water warm, but that’s not the best asset of it. The best part is that you don’t have to put the thing above your head to make it work. All you have to do is pump it up (15-20 pumps) and the water will flow from the showerhead. Great idea!